Once upon a … well, “Many Moons Ago” at least, there was a kingdom. There was a King, a Queen, a Prince – but no Princess for him to marry. One had to be found. One day she appeared, but the Queen wasn’t sure she was acceptable. So a test was devised to see if she was delicate and refined enough to be a real Princess. Twenty downy mattresses were stacked up and under the bottom one, a tiny pea was placed. If the pea disturbed her sleep, she would be deemed acceptable. 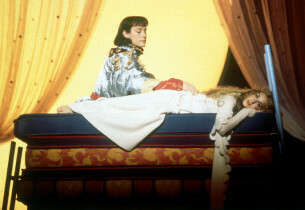 The pea did disturb her sleep and she and the Prince were married and lived happily ever after. The end. That’s the story as told by the Minstrel and his band of players. But he warns us that the actual story happened a little bit differently. Reality, it seems, differs from legend. We begin in the royal court where potential princesses are being interviewed. They seem to be failing, one after another, causing Prince Dauntless and members of the court to complain that they still have “An Opening for a Princess.” Why the urgency? A royal decree has gone out that no one may marry until Dauntless does. This is a big problem for the Lady Larken and her earnest Knight, Sir Harry. It seems they had too good a time at that picnic when they wandered off to watch the sun go down. Now, with a baby on the way, they have a strong reason to hope that Dauntless finds his Princess “In a Little While,” so Sir Harry goes off to find a bride for his Prince. In the meantime, Dauntless is beginning to think that his mother, the incessantly talkative Queen Aggravain, doesn’t want him to get married. Nonsense, she explains, she wants him to marry, but only if he marries a genuine, bona fide princess – just like she was not so many years ago. One spring day a few weeks later, Sir Harry is back with the new candidate. She arrives by swimming the moat. Fresh from the swamp-kingdom of Farfelot, her name is Winnifred the Woebegone. She’s heard they have an opening for a Princess – any Princess. She tells us that she’s “Shy” – painfully shy (and one man shy). Dauntless is smitten. But not Queen Aggravain. All she can say is “You swam the moat?” King Sextimus doesn’t say anything because he was rendered mute by a witch’s curse long before. But he can still communicate in his own sign language. He knows about Lady Larken’s delicate condition and wants to let his court buddies in on the secret so they can help find a worthy candidate. 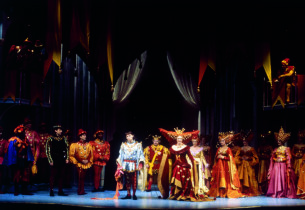 The three: “The Minstrel, The Jester and I” (the King), confide in each other while celebrating their unique ability to communicate; the Minstrel and Jester in song and the King in pantomime. Meanwhile Queen Aggravain is determined to come up with a test for this outrageous pretender. She and her confidante, the spooky, wizardly Merton, will only contemplate a test that seems fair, sounds fair, but isn’t fair. “Sensitivity” seems the perfect attribute to test, and the best way to test it is to place a tiny pea under the girl’s mattress – no, make that two – ten – no twenty mattresses! Winnifred is given a room in the palace and prepares for her test, whatever it may be. Dauntless, intrigued, wants to know more about her. She tells him what life is like in “The Swamps of Home.” Lady Larken enters and, mistaking Winnifred for a scullery maid, sets her to work – only to be astonished when Sir Harry comes in and addresses Winnifred as “Your Highness.” Harry and Larken argue and, humiliated, Larken decides she has no choice but to leave the kingdom. As she’s on her way out of the castle, the Jester, the Minstrel and the King distract her with tales of an idyllic place called “Normandy,” and convince her to wait for traveling companions. 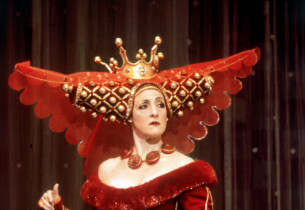 To ensure Winnifred’s failure, Queen Aggravain schedules an exhausting dance to tire her out on the night of her big sleep. And what better than that raucous new dance, the “Spanish Panic?” Why, this dance is so extraordinary that it even has echoes of eras yet to be! The dance exhausts everyone – except Winnifred, that is. “Let’s do it again,” she announces. Afterwards she asks Dauntless for a clue about what the test might be. He doesn’t know, but he knows (hopes) that she will pass. She thinks he’s adorable, and before he sings his “Song of Love” she tells him to call her by her nickname. “Winnie?” he asks. “Fred?” she answers. He is entranced: “What a beautiful name … so straight, so strong, so … you!” A rousing dance takes place, much drink is passed around, Winnifred tries every imaginable task she might be asked to perform in the test, and finally everyone collapses in a heap on the ballroom floor. Act Two begins as the bed is being prepared. Queen Aggravain orders “Quiet” in the castle. Dauntless helps Winnifred prepare for bed and wishes her “Goodnight, Sweet Princess.” But Winnifred is tired of waiting and her anxiety takes over. After all, where are the fairy godmother and the seven dwarves when you really need them? If she has no one to help her, she asks, how can she live “Happily Ever After?” In a dungeon deep below the castle, Queen Aggravain and Merton are preparing a potion to assure Winnifred’s sound sleep. Unbeknownst to them, the King, hiding in a suit of armor, is listening to their schemes. As soon as the evil plotters depart, Dauntless happens by and King Sextimus realizes that on the even of his son’s marriage, it is time to have that “Man to Man Talk” that he has, frankly, been avoiding for years. The Jester happens into the dungeon, too, and witnessing this moment between father and son, remembers back to when his own father “played the palace” in his “Very Soft Shoes.” By now Lady Larken has returned to confront Sir Harry. She didn’t want to leave – it was just that she didn’t know whether Sir Harry loved her. Does he? “Yesterday I Loved You,” he answers, “but today I love you even more!” Now the time comes for Winnifred to climb up into bed. Aggravain’s potion is offered, the mattresses are readied, and a Nightingale “Lullaby” is sung. Winnifred is exhausted. She lies down, but something is amiss. Something … something is disturbing her sleep. Finally, after repeated changes of position – front, back, sideways – she gives up and resorts to counting sheep. Morning comes and Aggravain announces to Dauntless with great regret that Winnifred’s test has taken place and that any real princess would have been unable to sleep with a pea under twenty mattresses. Dauntless, thinking Fred has failed, is shattered. But at that moment, the door opens and in comes Winnifred, still counting sheep. She has won, and Dauntless is ecstatic. Aggravain complains that there must be some mistake, but he will hear none of it, and, for the very first time, yells at his mother to shut up. This sudden change in him is the power that lifts his father’s long-rendered curse; the Queen becomes mute and Sextimus gets his voice back. “And,” Sextimus bellows, “I have a lot to say!” So the story ends as Dauntless guides Winnifred back up to the bed for the “Finale.” True, some helping hands had placed a few large metallic items – shields, maces, armor and the like – between some of the mattresses, but even when they are removed, Winnifred still can’t get comfortable. Finally, one tiny pea is plucked from beneath the very bottom mattress, and a resounding snore is heard from the happy, tired, but genuine Princess. 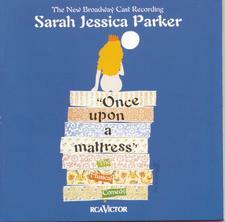 On May 19, 1959, an innocuous little musical based on Hans Christian Andersen’s The Princess and the Pea, with music by Mary Rodgers, lyrics by Marshall Barer, and a book by Barer, Jay Thompson and Dean Fuller, settled at the off-Broadway Phoenix Theatre under the title Once Upon A Mattress. 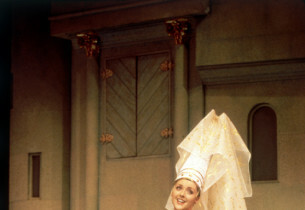 It starred a bright newcomer named Carol Burnett, whose antics soon turned the musical into a must-see hit. As a result, it moved to the Alvin Theatre on Broadway, on November 29, 1959, for a run of 460 performances, with the legendary George Abbott directing and Joe Layton choreographing. 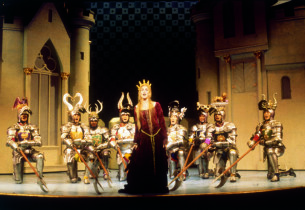 It took 35 years before it returned to Broadway, on December 19, 1996, in a revival directed by Gerald Gutierrez and choreographed by Liza Gennaro that only stayed around six months, for 187 performances. 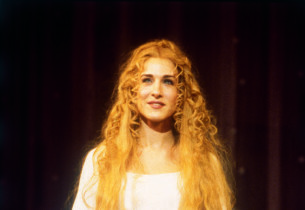 But it brought to Broadway a magnificent cast in which TV star Sarah Jessica Parker portrayed the damsel in distress, and Jane Krakowski one of her faithful companions.